One thing we all want from our consumers is interaction. More page views, more time-on-site and more clicks are good for business. But sometimes just making tools and content available isn't enough. We need to make sure our users are fully aware of all we have to offer. An RSS feed is a good way to stay top-of-mind with users. However, the RSS button, while familiar to us, is not well understood to the general public. In the same way, Twitter is an excellent way to connect quickly with some users but the majority have no idea what Twitter is all about. The ShareThis widget can help spread your content across the Web but, again, users are not likely to know what to do with it. Therefore, it becomes our responsibility to guide people to interaction. 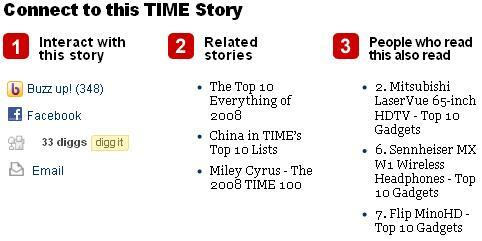 Take a look below at what Time Magazine online is doing. Not only are the tools there for users, but so are specific calls to action, in plain language. And while this is a good start, surely more can be done. You may have seen on other websites instructions like, "What Is This?" Consider adding an option like this. You could link that question to a pop-out screencast or video, or even simple text explaining what users can do with the tools you have provided. It's a safe bet to say that the easier you make interaction, the more inclined users are to participate.